When one is living in Tokyo, or any city for that matter, bees generally do not come to a person’s mind. However, over the last decade, beekeepers have been setting up hives in cities such as Paris, London, Hong Kong, New York and Chicago. But you probably wouldn’t know it. Urban beekeepers tend to have a low profile, usually setting up their hives on rooftops, hidden above the bustle of city life. A small organization in the Ginza district of Tokyo has taken a different approach to beekeeping, amassing a large group of volunteers and supporters. 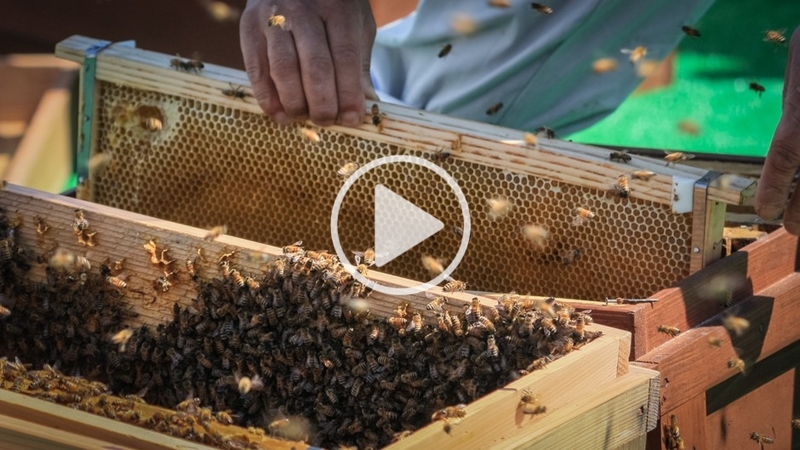 Since 2006, the Ginza Honeybee Project has brought visitors and volunteers up to its rooftops to experience nature in the city and participate in honey harvesting. The sharing of knowledge has not only helped the Ginza Honeybee Project develop and expand its operation but it has also helped build stronger connections between farmers/producers and consumers. The Ginza Honeybee Project organizes the event FarmAid Ginza, which occurs every few months and includes a farmers market and a forum to discuss issues such as community revitalization. At a recent event in July 2013, one panel discussed how city residents could support under-populated cities as Japan’s population declines, and assist areas that are still recovering from the 2011 Great East Japan Earthquake and tsunami. Every Saturday from spring to autumn, volunteers and visitors help in the harvesting of honey. In order to highlight the role bees play in the ecosystem, potted fruit plants requiring pollination (such as blueberries) are placed near the hive and are used as a teaching tool for incoming field trips of elementary school kids. Atsuo’s sense of empathy for the honeybees reveals itself through an observation about the difficult task of carrying nectar and pollen from flower to hive. “If we think about [carrying pollen] in human terms, it’s like walking home with a watermelon tied to each leg; it’s very hard work,” he says. Environmental awareness is key to the Ginza Honeybee Project’s mission, and this awareness is also important for building relationships with producers and consumers. The ability to market the honey as a local product has led to partnerships with a bakery, a hotel, bars, a beer company and a beauty product company. By growing food and eating together, Atsuo believes that relationships become stronger and that the number of people wanting to protect their local environment has increased in Ginza. The importance of bees in the food production system cannot be understated. Pollinators such as bees contribute US$200 billion a year to the global economy, helping pollinate 71 out of the top 100 crop species. With new research showing the deadly effects of pesticides on bee colonies, urban areas may provide a safe haven from Colony Collapse Disorder. On the other hand, too many urban beehives may also cause problems. According to a recent article in The Biologist, urban beekeeping has become so popular in London that the overpopulation of honeybees may be detrimental to their health and to the local ecosystem. Though urban bees may not play a part in large-scale agricultural production, they provide a key component in revitalizing the urban landscape. In the same way that a bee acts as a facilitator between plants, urban honeybees can act as a facilitator in deepening community ties and building environmental awareness. Tokyo Honey: A Role for Urban Bees by Eugene Kobayashi is licensed under a Creative Commons Attribution-NonCommercial-ShareAlike 4.0 International License.